Glasses of world-famous Niagara Icewine. Niagara Icewine is famous around the world, and this January there are a number of amazing events and festivals happening throughout the region that will connect you to the very best of Niagara’s delicious liquid gold. The 2018 Niagara Icewine Festival is taking place January 26th-27th at the Scotiabank Convention Centre in Niagara Falls, offering guests the chance to sample premium VQA wines and icewines from over 15 top Niagara wineries. The festival will also feature food pairings created by top Niagara chefs, live music, and a stunning outdoor Icewine Winter Wonderland complete with twinkling lights and ice sculptures. On January 19th, 2018 Windows by Jamie Kennedy Fresh Grill & Wine Bar will be hosting An Icewine Dinner with Jamie Kennedy where guests can experience delicious cuisine paired with wines from the award-winning Jackson-Triggs Winery. The evening will feature a mix and mingle with Chefs Jamie Kennedy and Jay Jackson, standing cocktail reception with canapés and pairings, five-course dinner with Niagara Icewine expertly woven throughout, and stunning views of Niagara Falls from the dining room’s floor-to-ceiling windows. Niagara Brewing Company in Niagara Falls has just released their one-of-a-kind Niagara Icewine Beer for a limited time at their craft brewery located on Clifton Hill. Stop by the brewery to try this delicious craft beer on tap or pick it up in 375ml or 750ml bottles. 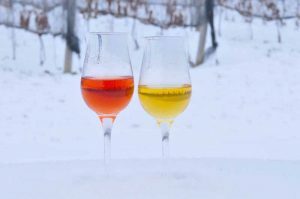 It combines the sweet and complex flavours of icewine with the bubbly goodness of beer and is the perfect winter drink for beer and wine lovers alike. Chateau des Charmes winery in Niagara-on-the-Lake will be hosting Icewine & Ice Cream events on January 6th, 7th, 13th, 14th, 22nd, 27th, and 28th in celebration of Niagara Icewine. This special winery event will feature tours and tasting of two Chateau des Charmes Icewines and will offer guests delicious hand-made local ice cream for one of the sweetest winter experiences in Niagara.